As winter melts away and spring approaches, we again reach a time in which day and night are equal, and we are given a chance to start fresh. This is a seasonal reading done only with the Ostara deck, designed to help you achieve balance, and to look at what you can bring forth into being. 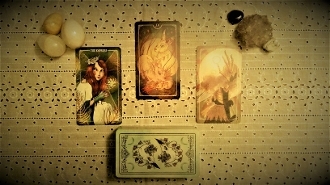 The three cards represent what you can “hatch” (or what needs to come into your life right now! ), your “seeds” (or what you should plant now and tend to over time), and what aspect of your life needs to be brought back into balance so you can move forward with a fresh perspective and a clean energy. This spread does not ask a specific question, but instead focuses on getting you the information you need to achieve your balance and new beginnings. Please include your full name and date of birth in special instructions, and I will take it from there!